It was a warm September day in Lewiston, Idaho. An in-bound trade mission of U.S. Commercial Service Trade Specialists from Belgium, Germany, Spain and Turkey were having lunch at the Campus Corner restaurant on the Lewis-Clark College campus. In the middle of the conversation, Angela Turrin, Madrid, Spain posed the mind provoking question, “why don’t the Snake River Boat Builders exhibit at Salón Náutico in Barcelona Spain?” Whoa, what did she ask for? 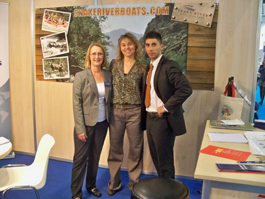 Fast forward two months and presto, Janet Bauermeister, U.S. Commercial Service, Spokane, Angela Turrin and myself were hosting the first ever Snake River Boats stand at Salón Náutico Internacional de Barcelona, November 5 – 13, 2011. 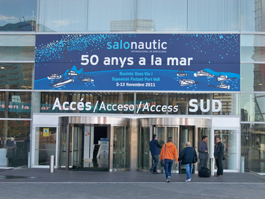 Salón Náutico, celebrating its 50th anniversary, is Spain’s largest marine trade show and one of the most important in Europe, hosting 324 exhibitors and approximately 120,000 attendees. 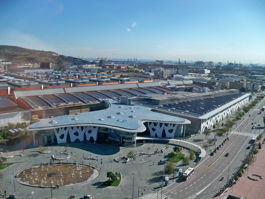 The show is located and produced by the Gran Via Exhibition Center, a stone’s throw (maybe several) from the beautiful Mediterranean Sea. Salón Náutico featured a wide assortment of marine products: accessories, canoes, kayaks, inflatables, jet skis, sail boats, motor boats, yachts, tugs and outboard engines. The Spanish marine industry is one of the few bright spots in a very beleaguered economy. Between January and September, 2011, 4,635 new boats were registered. Small boats, under eight meters in length, are the most popular, accounting for 87 percent of sales during the first nine months of 2011. Motor boats dominate the market with 61 percent of total sales. It is the only segment with an increase in registrations in 2011, at five percent. Angela Turrin did a masterful job in promoting the companies participating in the Snake River Boat Builders Export Program. Not only did she arrange for a well located exhibition stand, she was also able to arrange a multi-media presentation of the Snake River Boats dvd, prominently displayed on two large screens within view of hundreds of trade show participants. 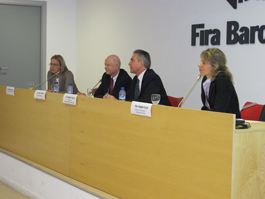 Angela arranged, promoted and managed a press conference dedicated exclusively to the Snake River Boat Builders Export Program, featuring special guest Consul General, Barcelona, Spain, Greggory D. Crouch. Ten members of local, regional and national media including newspapers, trade publications and television participated. I was amazed, as I strolled the aisles and talked with the various exhibitors, with the help of our interpreter Joan Muñoz Pérez, at how many companies remembered seeing the Snake River Boats Pavilion at boot Düsseldorf 2011. A gentleman representing a Norwegian boat manufacturer made the comment that the two most watched dvds at boot Düsseldorf 2011 were the one at his stand and the one in the Snake River Boats Pavilion. The importance of CE Mark Certification was again stressed by those we talked with. The most encouraging aspect of our participation at Salón Náutico was the genuine interest by boat importers, not only from Spain, but from throughout Europe. 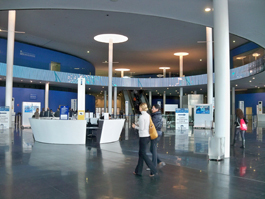 The purpose of attending was to continue the momentum developed at boot Düsseldorf 2011 and build momentum for boot Düsseldorf 2012. I must admit, the mission was accomplished with flying colors! Building a brand is a matter of steps. Salón Náutico was a significant step in developing the Snake River Boats brand. Angela, Janet and myself will now be following up on the leads developed in Barcelona, arranging meetings with the participating boat builders at boot Düsseldorf 2012 and possible visits to the Lewis-Clark Valley. Late November will feature a return visit by Michael Vollmer for CE Mark Certification and then everything is focused on the second annual pavilion at boot Düsseldorf 2012. So, be careful what you ask for, especially if you ask members of the Leadership Team of the Snake River Boat Builders Export Program. You may just get it. 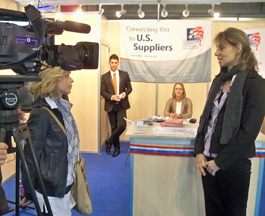 These people understand economic development and how to develop a brand…..the steps…..like exhibiting at Salón Náutico in Barcelona, Spain.